About a month ago I switched marine insurance companies. The new insurer required that I respond to several items mentioned in the survey done the previous year. Several issues had already been resolved. 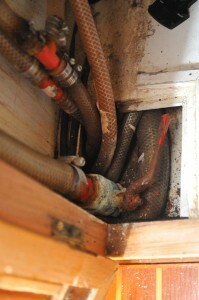 A couple more were easily fixed, such as adding a few clamps that were missing from the fresh water system. But one item turned out to be a major project: seacock repair. I had checked the seacocks at some point, but apparently not very carefully. Two of them appear to have failed open; perhaps the ball inside the ball valve dissolved. Without a way to close the seacocks a hose failure can sink the boat. Also there is no way to service the plumbing connected to the valves, such as the diesel engine’s seawater cooling system. The seacocks need to be repaired as soon as possible. This is an involved project, fraught with complications. The current seacocks are located in tight spaces and will be difficult to replace. None of the seacocks has a backing plate. The two failed seacocks are not “proper flanged seacocks” but rather inline valves attached directly to the thru-hull. While this is still common practice, even in new boats, it is not best practice. Two other seacocks are proper flanged seacocks but they require servicing. The work will involve plumbing, carpentry, and epoxy fiberglassing. Since I will be working on open holes in the bottom of the boat, the boat needs to be hauled out and put on a stand. With that sunk cost it makes sense to take advantage of the haul out and paint the bottom and change zincs. This is a lot to take on at once, but there’s no choice. The boatyard charges for each day the boat sits on a stand so it’s best to do as much advance preparation as possible. Beyond researching all the ins and outs, the advance prep breaks down into two projects. One is to create a thick sheet of fiberglass from which I will fabricate donut-shaped backing plates. The other is to prepare the areas around the seacocks so that there is enough room for backing plates and proper flanged seacocks. I’ll document this work in future posts.